Tata Sky announced its plans to launch 4k set top boxes in India by early next year. The launch plans were unveiled on Friday night when Tata Sky showcased the first ever Live telecast with 4K technology on SONY SIX HD using a 4k set top box in an event held on Friday night in association with Multi Screen Media Private Limited. The 2014 FIFA World Cup football match played between France & Germany on Friday night was telecast on SD, HD and an (4k enabled) UltraHD television from Sony Electronics with live 4k feed of the football match on SONY SIX HD. 4K at 8.3 Megapixels (3840×2160) has approximately four times the pixilation as 2K (1920×1080) the current HD standard, thus bring far greater clarity and more vivid colours on screen for viewers. 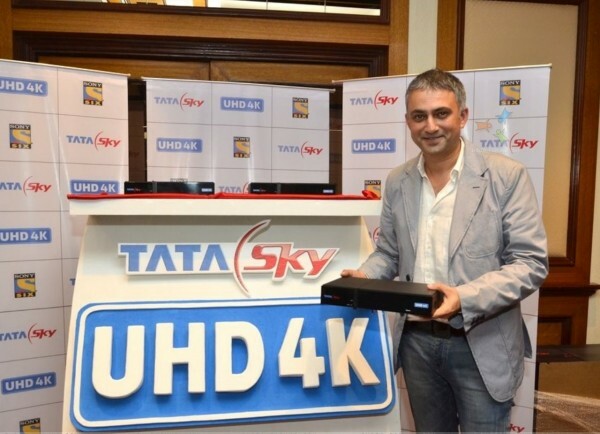 Tata Sky’s other launches included the HD PVR (Personal Video Recorder), Video-On-Demand (VOD) service, unique interactive services, Karaoke service and now the (4k enabled) UHD set top boxes in India. On this occasion, Vikram Mehra, Chief Commercial Officer at Tata Sky explained, “Being the market leader, we are always at the forefront of technology and have worked on delivering word class TV viewing experience. In today’s day and age, following global trends is not enough, we try to leapfrog them.